One of the more baffling problems of the human condition is our tendency to not always react favorably to more choice. Logic would dictate that the more choice and freedom we have, the happier we will be. However, experience and numerous studies often find this is simply not the case. 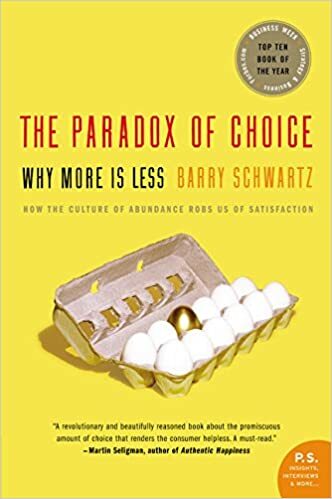 This is the precise topic that Barry Schwartz deals with in his book: The Paradox of Choice. He addresses one of the fundamental problems of our modern society. An overabundance of choice, and an expectation of high achievement, have increased instances of depression and other health problems. As a solution, Schwartz details 11 practical pieces of advice that you can apply to help you deal with too much choice, and find more reward in what you ultimately do choose.